Since the launching of the website in 1998, Steve's DISCOGRAPHY has continued to grow with each new release. Over the many years, visitors to this page never realized that each mini-CD cover was actually a link that would take you to another page where Steve had written a personal reflection about each recording. This incarnation of the DISCOGRAPHY marks the first time that there has been text to help to guide you as to how to better use the page for your own enjoyment and exploration. So, if a particular recording interests you, make certain that you just take a moment, and CLICK ON THE MINI-CD COVER, and then visit the page for that album. You will also now find that, at the bottom of each page, where the album's song sequence is listed, you can click on the BLUE BUTTON and listen to a soundclip of each song. This is also a new function for these pages. Please take a moment, and see how your explorations can enhance each visit to the website. Steve Marcus led his Count's Rock Band which featured 6 tunes, all composed by Steve Khan. The recording, never released on CD, featured Don Grolnick, Will Lee, and Steve Gadd. Steve Khan and Larry Coryell, one of the first contemporary Jazz Guitar duos, recorded 'live' at Montreux Jazz Festival in 1975, and in concert in Miami in 1976. This session features Randy and Michael Brecker, David Sanborn, Don Grolnick, Bob James, Will Lee, Steve Gadd, and Ralph MacDonald. As Steve's recording career begins as a solo artist, the first of three albums for Columbia Records attempted to keep alive the concepts and the sound forged together as part of the Brecker Bros. Band. An All-Star fusion band featuring the young Steve Khan, Billy Cobham, Alphonso Johnson, Tom Scott, and an even younger Mark Soskin. Features Randy and Michael Brecker, David Sanborn, Don Grolnick, Will Lee, Steve Gadd, and Ralph MacDonald, plus Mike Mainieri. From this period of Steve's work, "THE BLUE MAN" is often regarded as his best album. The performances by Steve's bandmates are uniformly spectacular and do stand the test of time. Features Randy and Michael Brecker, David Sanborn, Don Grolnick, Bob James, Will Lee, Steve Gadd, Rick Marotta, "Crusher" Bennett and Rob Mounsey. Of the three albums originally recorded for Columbia, this was the first one to feature only Steve's compositions. A "best of" featuring Randy and Michael Brecker, David Sanborn, Don Grolnick, Bob James, Will Lee, Steve Gadd, Ralph MacDonald as well as Mike Mainieri, Rick Marotta, Rob Mounsey and "Crusher" Bennett. The compilation features tunes from "TIGHTROPE"; "THE BLUE MAN" and "ARROWS." The critically acclaimed solo acoustic guitar recording featuring Steve's brilliant 9-song Thelonious Monk Medley, and interpretations of tunes by: Wayne Shorter, Joe Zawinul, Lee Morgan, Randy Brecker, and Horace Silver. 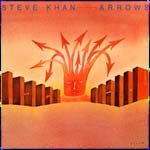 The beginning of a new Khan era, this band featured Anthony Jackson, Steve Jordan, and Manolo Badrena. A true classic and is often viewed as one of Steve's finest albums. The playing and sound created by Anthony Jackson and Steve Jordan are revered to this day as influential for generations of bassists and drummers. Known in the U.S. as "BLADES," Steve Khan, Anthony Jackson, Steve Jordan, and Manolo Badrena, recorded live in Tokyo during their very first 'live' performance. Once again, the work of Anthony Jackson and Steve Jordan set the pace for some of the greatest players to follow on their instruments. As Eyewitness, Khan, Jackson, Jordan, and Badrena, take their concepts to new heights with the addition of Manolo's incredible vocals! This was the last of the three albums recorded with Steve Jordan on drums and featured some of his most inventive sonic and rhythmic concepts. His solo on the title track amazes to this day! The first of two albums with keyboardist/arranger, Rob Mounsey, "LOCAL COLOR" was nominated for a Grammy. Their work together stands as an impressive and unique musical collaboration. A chance to work with Jean-Michel Folon, 3 new compositions accompanied Folon's animations in 3 Japanese TV spots. The guitar featured on this page was taken from a drawing Folon did for Steve. Some 5 years after "CASA LOCO" had finally been released, Steve, Anthony, and Manolo made the commitment to record together again, this time, Eyewitness was joined by Dave Weckl on drums. The new compositions took the work the band had done with the extended song form to new heights. Because of the promotional power of GRP Records, this album reached the most people worldwide during the CD Age. Features Steve in his first truly straightahead Jazz in trio. Here, Steve returned to the music that first inspired him to play, joined by old friends, Ron Carter on bass, and Al Foster on drums. A wonderful collection of unique standards that represented the very reasons why Jazz became Steve's calling. A 2nd album featuring both Ron Carter and Al Foster for six acoustic Jazz interpretations from Steve's book of unique Jazz standards. The recording also included 3 great tracks bringing back together the Eyewitness band concept with both Anthony Jackson, Manolo Badrena, and now the great Dennis Chambers on drums. The Webmaster's personal favorite, this recording is Eyewitness at its best, with Anthony Jackson, Dennis Chambers, Manolo Badrena, and special guest Michael Brecker appearing on 3 tunes. Though the music and the performances are incredible, this albums is arguably Steve's most beautiful sounding work from a purely audiophile perspective! Steve Khan records with John Patitucci and Jack DeJohnette, plus percussionists Don Alias, Bobby Allende, Marc Quiñones and Café	to make this a 5-star straightahead Jazz CD. It is a recording focused, yet again, on the kinds of Jazz standards that helped to shape Steve's earliest memories in the genre. Ten years after "LOCAL COLOR," Steve teams up with keyboardist, composer, and arranger Rob Mounsey, plus the incredible Marc Quiñones playing percussion. A truly spectacular recording featuring the unique compositions that seem to only happen when Steve and Rob come together for a special project like this one! Steve as co-leader with Dave Samuels & Dave Valentín w/ John Benitez, Richie Flores & Robert Vilera. 3 Khan originals: "Descarga Canelón"; "Charanga Sí, Sí" and "Safe and Sound." A unique adventure in Latin Jazz! Steve as co-leader with Dave Samuels & Dave Valentín w/ Rubén Rodríguez, Richie Flores, Luisito Quintero & Dafnis Prieto. 3 more Khan originals: "Maluco. "; "El Tacaño" and "¡Cá-ni-mo!" Further adventures in Latin Jazz! Steve records again with John Patitucci, Jack DeJohnette, and Manolo Badrena. This time adding Latin percussionists Ralph Irizarry and Roberto Quintero for what Japan's "SWING JOURNAL" describes as "a monumental achievement in Contemporary Jazz!" Grammy nominated! Patitucci, DeJohnette, Badrena, Irizarry and Quintero are all joined by Bob Mintzer and Badal Roy for the spectacular "El Faquir." 2 other tunes feature: Randy Brecker, Rob Mounsey, Rubén Rodríguez, Marc Quiñones, and Bobby Allende. Recorded live in '94 in Köln for a WDR radio broadcast, this remarkable double-CD features Steve's trio with astounding and truly historic performances by Anthony Jackson and Dennis Chambers! Featuring: Anthony Jackson, Dennis Chambers, Manolo Badrena, Marc Quiñones and Bobby Allende. Special Guests include: Rob Mounsey, Andrés Beeuwsaert & Tatiana Parra. 1st Latin Jazz record led by a guitarist in nearly 50 years!!! Featuring: Rubén Rodríguez, Dennis Chambers, Marc Quiñones and Bobby Allende. Guest Artists include: Randy Brecker, Rob Mounsey, Gil Goldstein & Mariana Ingold. Steve's adventures in Latin Jazz continue!!! The three groundbreaking albums from 1981-83, now offered together on a spectacular reissue. These albums featured the core group: Anthony Jackson, Steve Jordan, and Manolo Badrena. It marks the first time that "MODERN TIMES" will be available on CD outside of Japan. Featuring: Rubén Rodríguez, Marc Quiñones, Bobby Allende and Mark Walker. Guest Artists include: Randy Brecker, Bob Mintzer, Mike Mainieri, Rob Mounsey & Tatiana Parra. Great things come in 3's, the companion to "PARTING SHOT" & "SUBTEXT." Another guitar masterpiece in Latin Jazz!!! COMING SOON IN 2018!!! Eyewitness returned from 1989-1994, first with Dave Weckl for "PUBLIC ACCESS" and then Dennis Chambers for both "HEADLINE" and "CROSSINGS"! Michael Brecker joined the group for 3 tunes on the latter. Now, all of these great performances come to you on this incredible new reissue.